NEW YORK – Hello Giants fans, I would like to wish you and your family a very Happy Thanksgiving! I would also like to wish the players, staff and coaches a very Happy Thanksgiving and their families as well. This includes Kate Mara (follow back @nygreporter or have your agent email me, I want to interview you) and both the Mara and Tisch family owners. I would like to thank all of you for the classy way you conduct business and for the entertainment you have given my family for generations. I still firmly believe the Giants will be back in the playoffs this year. I hope all of you can think of something to be thankful for this holiday season. I have heard a saying that goes “You buy the ticket, you take the ride”. It means no complaining, you take the ride of life and one thing leads to another and based on your choices, an outcome blossoms. Today is the perfect day to call an old friend or family member you haven’t spoken to in a while. Have them pass the phone around the room and catch up with everyone. Some of you can’t be home for the holidays, I have been there myself once or twice. Keep your head up and maybe things will be different next year. To the military stationed all over the world, you are not forgotten. Thank you for your service for your country. I hope all of you have some peace this year and get to enjoy yourselves a bit. If you see someone in uniform, stop them and shake their hand. The Giants play the Saints and QB Drew Brees on Monday Night Football. This is going to be a very difficult game to win but knowing the G-Men, they could end up blowing them out by 25 points. I believe the Giants can beat anyone but the Saints and Packers were clearly the top two teams we had to play all year. The first of the two is about to go down on Monday night. The Giants must stop Saints TE Jimmy Graham (force the Saints to use a TE as blocker in defensive scheme), RB Darren Sproles and the defensive ends must get to Brees often. QB Eli Manning must have one of his standard big games to get Big Blue that seventh win of the year. Be safe and be smart, drink responsibly. 12:30 PM EST – Green Bay Packers at Detroit Lions on FOX Sports. 4:15 PM EST – Miami Dolphins at Dallas Cowboys on CBS Sports. 8:30 PM EST – New York Giants vs. New Orleans Saints on ESPN. What is your all time favorite Thanksgiving family tradition? What is your traditional meal? – The traditional Thanksgiving day meal in my family has always been turkey, stuffing, mashed potatoes, corn, peas, carrots, cranberry sauce, apple sauce, biscuits, brown gravy, pie, beer and wine. 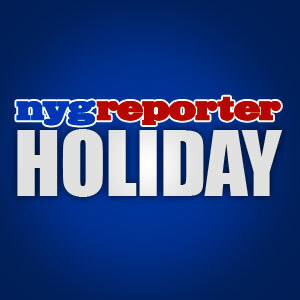 RD – nygreporter.com – Happy Thanksgiving! This entry was posted on Thursday, November 24th, 2011 at 12:01 PM and is filed under 2011 Fantasy Football, 2011 New York Giants, 2011 NFL Regular Season, Big Blue, Bill Parcells, Chris Mara, East Rutherford, Eli Manning, Ernie Accorsi, G-Men, George Martin, Giants, Giants Coaches, Giants Front Office, Giants History, Giants Roster, Giants Stadium, Jerry Reese, John Mara, Jonathan Tisch, Justin Tuck, Kevin Gilbride, MetLife Stadium, Monday Night Football, New Jersey, New Meadowlands Stadium, New York, New York Football Giants, New York Giants, NFC East, NFL, NFL New York Giants, NFL Schedule, Nilay Shah, NY Giants, NYG, NYG Blog, NYG Exclusive, NYG Fantasy Football, NYG Holiday, NYG Regular Season, NYG Reporter, NYG Road Warriors, NYG Schedule, NYG Story, NYG Website, nygreporter, Pat Hanlon, Perry Fewell, Pro Football Hall of Fame, Roger Goodell, Steve Tisch, Sunday Night Football, Timex Performance Center, Tom Coughlin, Tom Quinn, University of Albany, Wellington Mara, Wounded Warrior Project. You can follow any responses to this entry through the RSS 2.0 feed. You can leave a response, or trackback from your own site.